From the Hancock County Courthouse, go 8.0 miles northwest of Sparta on Hwy 16. You will cross Shoulderbone Creek and pass state highway 77 north. Turn right on Centennial Road and go for approximately 4.7 miles. 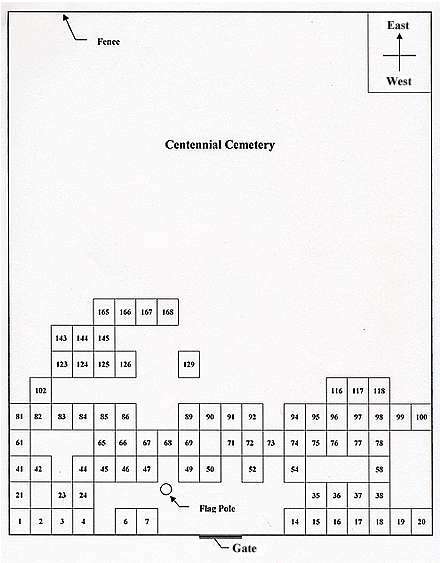 The church and cemetery are on your right. 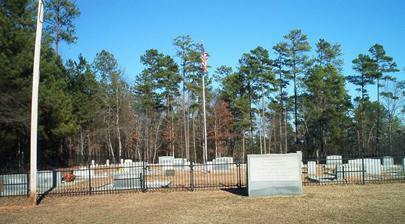 Graves are numbered to indicate the number of empty spaces between graves. On same headstone as William H. Lanier. On same headstone as Jessie M. Lanier. On same headstone as James E. Lanier. On same headstone as Lenolia P. Lanier. On same headstone as Joseph Webster Bickers. On same headstone as Bessie Beatrice Southard Bickers. On same headstone as Alex Wesley Prather and in same lot as John Franklin Kimbrough, Jr.
On same headstone as Mollie C. Prather and in same lot as John Franklin Kimbrough, Jr. In same lot with Mollie C. and Alex Wesley Prather. "Precious in the sight of the Lord is the death of his saints. Ps 116 v 15". In same vault with Dorsey Lee Campbell. In same vault as Tyrue Manley Campbell. On same headstone as Robert Edward Lanier. On same headstone as Lottie O'Kelley Lanier. m. March 22, 1959. On same headstone as James E. Lanier, Sr. Maiden name per obituary. m. March 22, 1959. On same headstone as Shirley C. Lanier. No death date as of Mar. 15, 2002.
m. Dec. 21, 1980. "Mother" "son Michael". On same headstone as James E. Lanier. No death date as of Mar. 15, 2002.
m. Dec. 21, 1980. "Father" "son Michael". On same headstone as Sandy L. Lanier. On same headstone as John Marshall Bustin. On same headstone as Lucy Adams Bustin. On same headstone as John D. Bickers. On same headstone as Lillie B. Bickers. On same headstone as John M. Ferguson. On same headstone as Allie J. Ferguson. d/o Mr. and Mrs. R. C. Ferguson. s/o J. W. and M. S. Estes. "Darling, we miss thee"
"Died 1895, infant daughter Martha, son Frank age 8"
"Dedicated by his descendants July 30, 1995"
"Born in Patchogee, NY" In same lot with Ronald A. Moger and Robert H. Wenzell. "Born in Patchogee, NY" In same lot with Evelyn M. Moger and Robert H. Wenzell. In same lot with Eveln M. and Ronald A. Moger. No death date as of March 15, 2002. On same headstone as F. Florine Martin. On same headstone as D. Posey Martin. On same headstone as James Pierce Hodnett. In same lot with graves 90-95. On same headstone as Sibyl Bickers Hodnett. In same lot with graves 89-95. On same headstone as William T. Bickers. In same lot as graves 89-95. On same headstone as Pearl M. Bickers. In same lot as graves 89-95. In same lot with graves 89-95.
w/o L. O. Martin. "Rest in quiet sleep while friends of thee weep." In same lot as graves 89-94. On same headstone as Louise E. Martin. 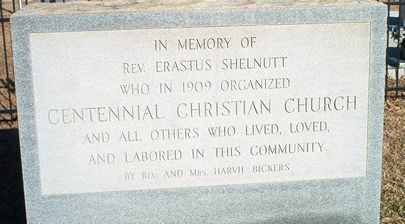 On same headstone as Summie C. Martin. "Mother". On same headstone as Claude C. Campbell and in same lot with Claudette C. Lee. "Father". On same headstone as Kitty P. Campbell and in the same lot as Claudette C. Lee. No other information on this old marker that is within a low fence. Possibly a twin to Clara M. Patton in next grave. d/o W. J. and E. M. Patton. s/o W. J. and E. M. Patton. Mason-York Rite. "God knoweth the heart"
In same lot with graves 166-168. Naval Oceanographic Office emblem. In same lot with graves 165-168. No death date as of Mar. 15, 2002. In same lot with graves 165-168. No death date as of Mar. 15, 2002. In same lot as graves 165-167.